In this article we not only cover details on how to choose your stand up paddle, we also go over how to measure your paddle for comfortable and injury free use. Choosing a stand up paddle board factors in your size and weight. Choosing a paddle though, is more about the type of paddle boarding you do, with a little thought given to where you SUP, how you transport and store your SUP gear and how much you want to spend. These are by far the most important factors in choosing a paddle, and shaft, for stand up paddle boarding. Do you ride waves, do downwinders, or just cruise around on the weekends? If you are a weekend paddler at a local river with friends, you might consider using an adjustable alloy shaft with plastic blade. If you are a frequent paddler going on long downwinders, you might want a larger, lightweight carbon blade with a flexible shaft to avoid stressing your shoulders. Where you paddle board can have a bearing on the construction of your paddle. If you are in the open ocean or if you are paddling around rocks or logs in your local river. You don’t want to be dinging your premium carbon blade on some nasty rapids! How do you transport your gear to the beach/lake/river… etc? Do you have a hard or inflatable board? Do you want a 3 piece paddle so you can pack it in the same bag as your inflatable paddle board? Paddles are much easier to transport and store so this is less important than when choosing a board. 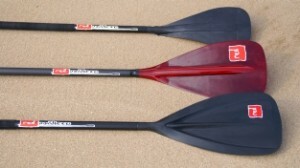 When it comes to measuring your paddle, there are several opinions on how to do it. 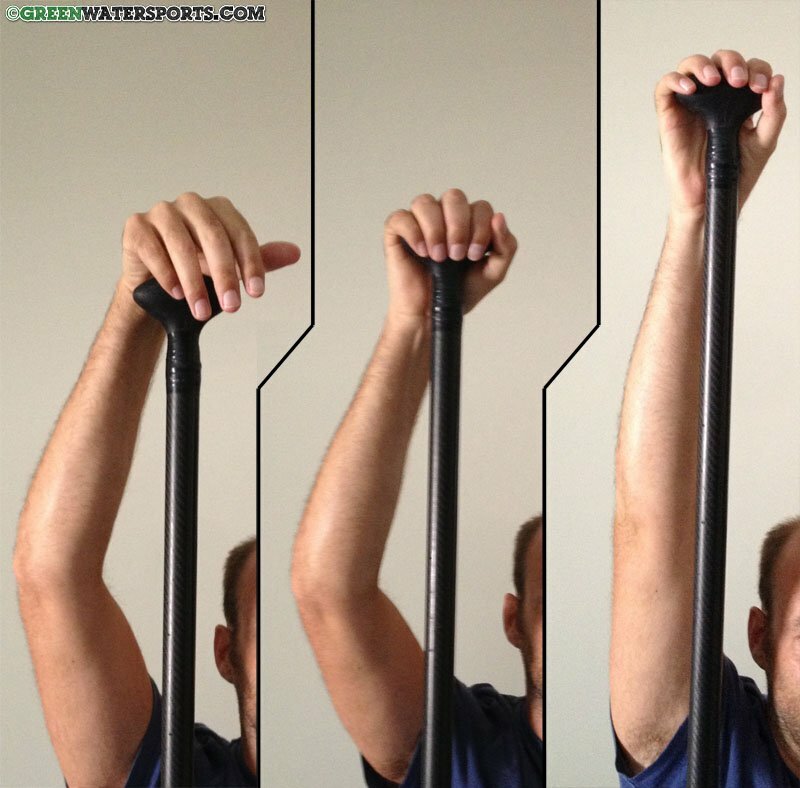 For general paddle boarding, but using an efficient stroke technique you’ll want to measure the paddle in this way: Place the paddle blade down on the floor, reach up with one arm, slightly bent elbow, without twisting your body to reach higher and then just wrap your hand over the handle. If you need to reach or twist to grab the handle, the paddle is too long. If you don’t need to reach up at all or your arm is very bent, the paddle is too short. From this position you can adjust the paddle length to feel. Check out our SUP paddle length guide which includes approximate paddle lengths for your height and style of paddling. As your technique and strength improve, you can go shorter. You can also go shorter for SUP surfing. You can also go longer for racing, to get a greater reach for the catch. Don’t go too short though as it puts more pressure on shoulders and lower back. Same goes for too long, it puts more pressure on your shoulders. Any questions about choosing a paddle or measuring a paddle, please contact us on 1-888-252-4983 or via our contact form. Thanks for the good info here. Thanks very much Julian. I’ll look forward to it. This is very kind… Your service is great. I received the order confirmation. Thank you! Very happy with the service that you and Green Water Sports have given me.